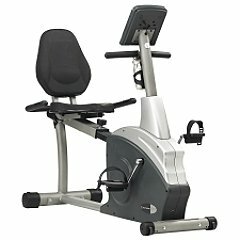 The Schwinn 203 recumbent bike is an alternative for people who are not comfortable on, or are not able to use, an upright exercise bike. If you suffer from hip or knee pain, or have trouble walking, a recliner is a way to keep active and still get a cardio workout. The easy-to-read LCD display shows your time, RPM, distance, pulse, and calories. 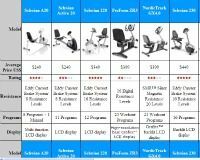 It comes with 12 Preset programs, as well as 4 Heart Rate, and 1 User-defined. UPDATE: The 203 recumbent bike is no longer available. 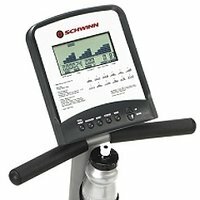 Check out the latest Schwinn exercise bike reviews for the latest models. Pro trainers like the Schwinn 203 budget model because it is an extremely quiet, comfortable, durable, and affordable recumbent bike. It is user-friendly and provides a good selection of workout programs beyond the boring, basic Manual setting. Its eight resistance levels provide a challenge and a change of pace as you progress through your daily workouts. For maximizing the comfort level of the rider, the Schwinn 203 exercise bike has adjustable handlebars and wider pedals with integrated leveling feet. 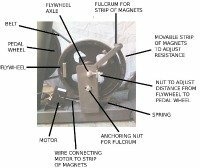 Consumers writing in exercise bike reviews mention that, despite the lighter weight of the bike, it is remarkable steady even for larger users. The Schwinn 203 is quiet enough that you can watch TV, read a book, or talk on the phone while riding. The reviewers had a few minor complaints about the magazine rack not being large enough to hold anything, and the cooling fan on the console being weak. There was one other issue with the Schwinn 203 recumbent and that was that while the seat can be moved further back for tall riders, it does move forward, and this caused shorter people (under 5’4”) to complain about not being able to comfortably reach the pedals. Most seemed to solve this issue by using a cushion or pillow placed behind their backs. The $399 Schwinn 203 recumbent exercise bike is a well-designed beginner’s model for getting a low-impact cardio workout. It has the basic features you need in a recliner and should hold up for a couple years even with frequent use. It doesn’t have all the snazzy features of a higher priced machine, such as the Schwinn 231, but if $400 is the limit of your budget, then the Schwinn 203 recumbent bike still rates a Good Buy.